All content copyright Jacob F. Lucas unless otherwise specified. THE HEART OF AUSTRALIA: ULURU KATA TJUTA NATIONAL PARK. "This is Anangu land and you are welcome. Look around and learn in order to understand Anangu and also understand that our culture is strong and alive." A part of me has always wanted to visit Uluru and experience what this sacred part of Australia is like. As an Australian, I feel a connection to this place - - a sense of country, a symbol of national pride, a feeling of belonging. Yet, it took me emigrating from Australia and over thirty years of my life to visit this place. It's true what they say - you don't really fully understand and appreciate what you've got until it's not there anymore. When I travelled to Uluru over the summer of 2013/2014, for the first time since moving away I realised just how much I missed my homeland. I realised, by visiting and experiencing this mystical, iconic location, just how rich a connection I had to my country. I remember flying into the area, looking at the landscape from above in awe. The ground was a vibrant red, glowing in the sun. I stepped off the plane and felt the full force of forty five degree heat smack me across the face. It was perfect. I jumped in the rental car, and drove off into the desert. The horizon was completely flat but for the silhouette of Uluru. Thoughts were flying around in my head regarding all kinds of things on my life. I recall being very thankful for this chance to reflect and look forward. I remember sitting there during one night I spent at the park, and being alone with Uluru. Darkness enveloped the world but for the stars of the southern sky. I remember not less than 24 hours prior being mesmerised by the sight and stature of Uluru for the first time. I remember being blown away even more than that first glimpse by the sight of it underneath our Southern Cross. Underneath a clear, starry sky. Above the red earth and surprisingly green shrubs. I remember closing my eyes and realising that I wasn't alone out here. The desert was coming to life before my ears. Under the shroud of darkness, the world began to speak back to me. I can still close my eyes and hear my footsteps on the dirt as I hiked around the base of the rock. I can hear the crickets chirping. I can hear the birds flying overhead. I can hear pure silence. Before visiting the park I thought that I would be visiting the middle of an arid, red desert. Don't get me wrong, it absolutely is in the middle of an arid, red desert. Nature is a harsh force to be reckoned with out here. The heat of the midday sun will dehydrate and disorientate you quicker than you realise it. I had no idea anything or anyone could survive out here. Yet, what I quickly discovered was just how wrong I was. 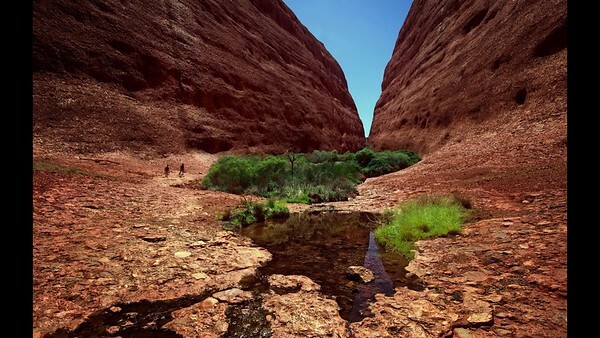 This magical place, Uluru Kata Tjuta National Park, is an oasis of life. Trees are lush, green, and grow tall. Tiny, little critters run about all over the desert floor. It's a centre of vibrant, abundant life of all forms. The Anangu people have been making their lives here for tens of thousands of years, cherishing the historic beauty of their landscape, caring for it as stewards of Uluru through the ages of our planet. As I walked around, my senses felt truly heightened. Every sight, smell, and sound was amplified and I believe forever linked me to my country. I understood why Anangu care so deeply for their land. I felt at home. I felt like I was really able to see Australia for what it is - a lucky country; a truly beautiful place amongst the vast oceans in our planet. Australia has always celebrated the underdog -- we love a good yarn about the battlers. It doesn't feel possible for life to even exist here. Not only does life exist here but it has won the battle and is overwhelmingly prevailing -- in every single sense. This is a part of our world which commands true reverence and celebration. This project was produced in accordance with Uluru-Kata Tjuta National Park media guidelines and with respect to the living culture of Anangu, the traditional owners of Uluru-Kata Tjuta National Park. All images are approved for commercial use under a photography permit.